WASHINGTON – Workers across the country have stood up in the past month to fight for better wages and working conditions. 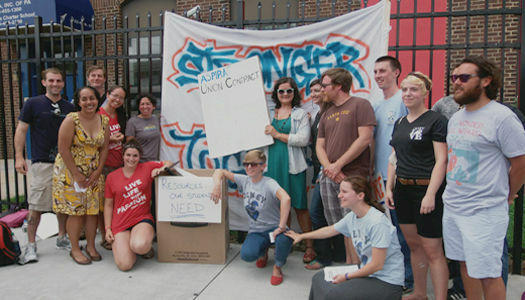 Philadelphia Charter School teachers organize with AFT: Teachers and other staff members at Olney Charter High School voted to organize a union earlier this week, becoming the largest charter school in Philadelphia to organize. The teachers and staff will be represented by the Alliance of Charter School Employees, which is an affiliate of the American Federation of Teachers. Sheet Metal Workers hammer out major victories across the country: Earlier this spring, transportation workers in South Florida voted overwhelmingly to join the Sheet Metal, Air, Rail, and Transportation (SMART) union. SMART workers have also organized in Buffalo, NY, and secured a major Project Labor Agreement in Long Beach, CA. Aircraft Mechanics flying high after organizing win: Over 100 aircraft mechanics and other technicians at the Beechcraft Service Center in Wichita, KS joined International Association of Machinists District 70 last month. IAM’s organizing efforts took off recently with several thousand workers organizing at Textron Aviation, which includes Cessna and Beechcraft aircraft. Ohio nurse wins justice, $2 million after she’s targeted by hospital: After suffering through a campaign of intimidation and abuse, Ann Wayt, a Cleveland-area nurse won a $2 million award against Affinity Medical Center after their attempts to fire her and ruin her reputation in retaliation for Wayt’s efforts to organize workers. UConn graduate teaching assistants win big with first contract: Approximately 2,300 graduate teaching assistants at the University of Connecticut represented by the Graduate Employee Union, a branch of the United Auto Workers, reached a tentative agreement on a first contract with the university, ensuring an increase in stipends, a break in university fees, and greater health benefits. Major health insurer ensures healthy relations with workers by raising wages: In the wake of national calls by workers to raise wages, Fortune 100 health insurance company Aetna increased pay for their lowest paid workers to $16 an hour last month, raising wages for 5,700 employees. Aetna executives cited evidence that a higher-paid workforce provides better customer service and decreases turnover as reasons for the pay hike. New York workers press lawmakers to pass landmark equal pay law: Workers in New York secured a major win last month as the New York State legislature passed a slate of equal pay protection laws, including legislation that prohibits employers from telling workers they cannot discuss pay at work, and strengthening prohibitions on paying women and men separately.